The Mindy Project: "Danny and Mindy"
Mindy’s entire life – at least what we’ve seen from these last two years – has been based on the hope that she could live the life of one of her favorite romantic comedies. Yet Mindy lives in the real world, where things aren’t exactly like the movies. No matter how hard she tries, she’ll never be Julia Roberts or Katherine Heigl in one of their films, because she’s destined to be Mindy Lahiri. Instead of Mindy trying to be in a movie, she should’ve been trying to make her own rom-com, with her own rules, and starring her. In last night’s season finale, she gets that silver screen love story with the help of Danny in one of the show’s best episodes. In the last few weeks, we’ve seen Danny realize that he has made a huge mistake by breaking up with Mindy. While on one of their Subway trips to work, Mindy bats her eyelashes at a guy. A week later, she sees in a Missed Connection that he has been looking for her. It seems like the rom-com romance she’s always wanted! The only problem is that Danny is pretending to be her Missed Connection. Taking hints from You’ve Got Mail, Danny builds a budding romance with Mindy, even while Mindy is still technically seeing Charlie, who easily gives her the go ahead to follow her heart. Danny then takes a hint from another Tom Hanks-Meg Ryan film, Sleepless in Seattle, and he tells Mindy, playing the secret admirer, to meet him at the top of the Empire State Building. While getting dressed in a suit Bradley Cooper would wear, he’s surprised by Mindy, who has stopped by to get Danny’s help getting gum out of her hair. While there, she admits that they weren’t right for each other, which makes Danny change his mind about his plan and leaves Mindy waiting all night at the top of the Empire State Building. Mindy and Danny start bonding again, until Danny is forced to come clean to Mindy. She of course is shocked by the revelation. Later, with the help of the rest of her coworkers, who now know everything, she decides that Danny does love her now. Danny had told her that he would wait all night for her at the top of the Empire State Building, so she heads up the 104 floors to meet him. Danny has already left dejected after an hour of waiting, but once again thanks to the coworkers, they convince him to take the elevator up and meet her. When he gets there, she is nowhere to be found, but when he hears a gasping woman, it’s clear that Mindy has met him there because they feel the same way. “Danny and Mindy” is clearly about these two finally coming together for what seems like for good. Danny has been a very difficult character to stick with in this second half of the season, what with his quick turnaround on his feelings for Mindy and his almost immediate rebound, but he’s made up for it. Before, Danny was too caught up in himself to ever make his feelings this known, but now he’s stealing ideas from every romantic comedy he can to win her back. What we get is a romantic comedy perfect for the both of them, with Danny running to meet Mindy to the tune of Bruce Springsteen’s “Dancing in the Dark,” then getting hit by two cars, and Mindy living just enough in the world of the movies, but also making her own non-cinematic choices to make the film her own. For the first time, these two meet in the middle. And it works. The supporting cast largely takes the back seat in “Danny and Mindy,” but give just enough to make their contribution essential and exciting for next season. Morgan and Tamra are now completely open about their hooking up; Peter is now actually dating Lauren, after she said he was too childish for her; Betsy quietly disappears for us to likely never see her again. It’s fun to see them all hanging out together in a group, trying to help the story move forward by getting Danny and Mindy together. 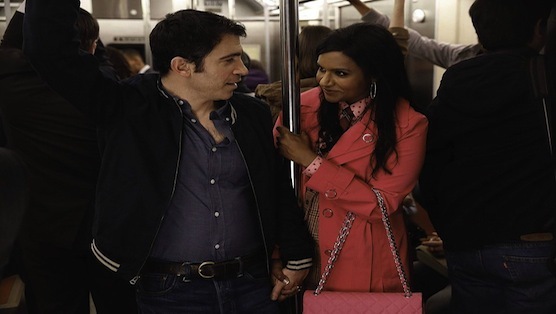 The Mindy Project might not be the most consistent show ever, but this season we’ve seen these characters grow stronger—not only in terms of stories, but also in just how hilarious they can be. Morgan and Peter have both become just as fun to watch, if not more so, than Danny and Mindy. When the show can utilize its supporting cast accurately, it really succeeds. When The Mindy Project really works, it’s one of the most fun shows on TV. With Mindy and Danny hopefully anchoring the first episodes third season, I can only imagine that The Mindy Project will get stronger with next season.